Carry a pocket magnifying glass that's small enough to fit into your pocket or purse. 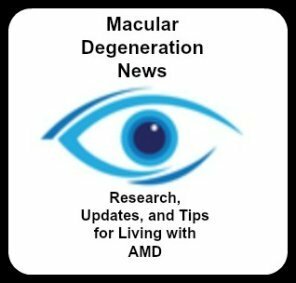 A pocket magnifier is a handy visual aid for those with macular degeneration. Keep one in your pocket so you don't have to go look for one if all you need is to quick check a pill bottle, ingredients on a label, or a score in the newspaper. A small hand held magnifying glass can be useful and handy whether you are at home or out shopping. Use it to quickly read a prescription bottle, a store receipt, product instructions, a price tag or a label on a purchase. This one is 4" when closed so it's easy to take with you in a pocket or a purse. 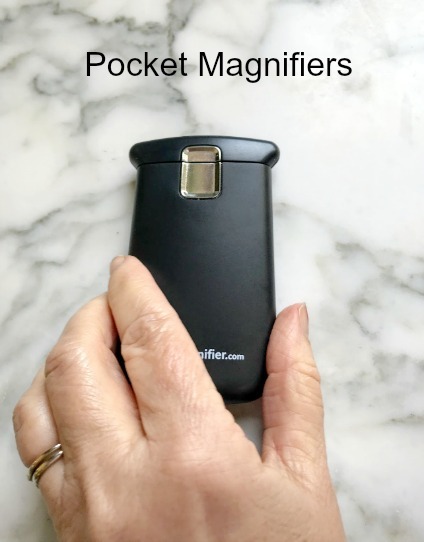 Keep one in the bathroom, the kitchen, bedroom and garage for quick spot magnifying. Keep one in your purse or pants pocket so you always have a magnifier handy. 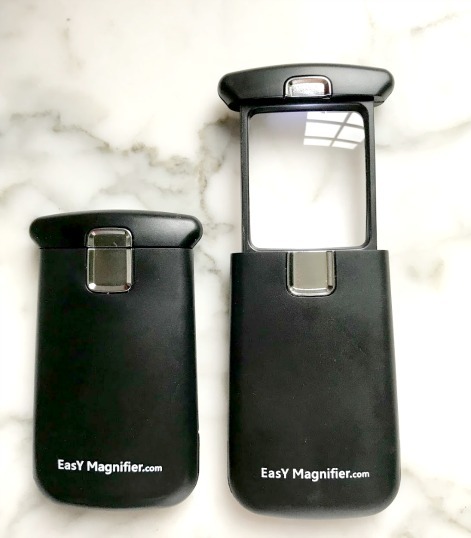 We purchased 3 pocket size magnifiers for my father-in-law (who has wet age related macular degeneration)to keep in different rooms of the house - like the bathroom, the kitchen, and garage. He really likes the LED magnifiers like this one pictured that provides light and magnification. Slide it open and the light automatically goes on. The quality lens means there are no ripples or distortion. It offers 3X magnification. These low vision magnifiers can come in many different sizes - some of them are small enough to carry in your wallet. This handy credit card size magnifier fits right into your wallet. It is a 3X magnifier with an LED light. 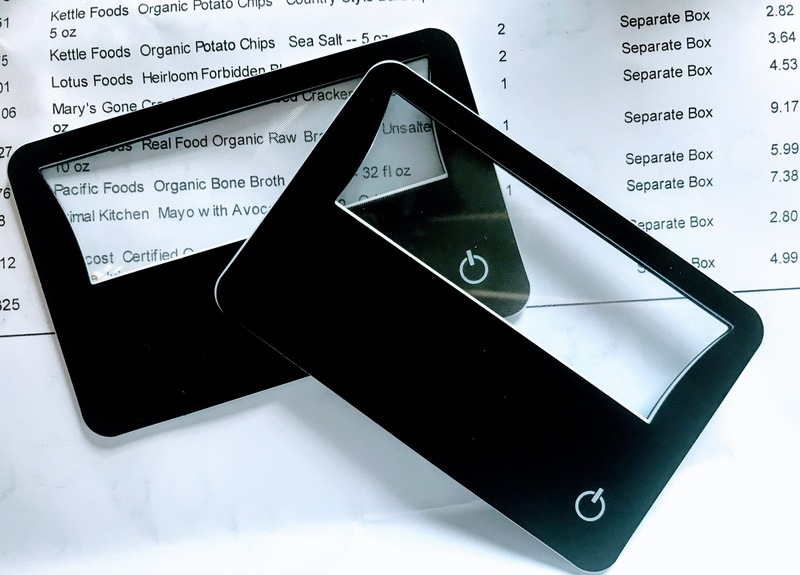 Convenient and small enough to fit into your wallet, this magnifier can be used to check a price, a label or a menu. Anytime your wallet is with you so is your magnifier. Not only are these magnifiers handy for at home, they are also great to take with you when you go out to dinner, shopping or to a friend's home. Amazon carries a nice assortment of these magnifiers. The one pictured is by Bausch and Lomb. Instead of just one lens - it has 3 - all at different powers - 5X, 7X and 9X. And if you need more than that you can combine them for a higher power magnifier. For instance use the 5X and the 7X together you will get 12X magnification. This is a great option for times when there isn't much light and higher magnification is needed. The lenses are made of high quality material that provides good clarity and no distortion. Just remember that if you combine the lenses for higher magnification you will need to hold the magnifier closer to the object being magnified. Remember that this has a small viewing area for spot checking a label, a prescription bottle, small instructions, etc.